Grammy Nominated artist Big Sean will host his official after party at the Historic Howard Theatre in Washington, DC April 13th from 10P-3AM. The event is brought to you by The Standard Events and Dave and Ray Ent., the “lifestyle coordinators” responsible for many upscale events throughout the DC Metropolitan Area. The recently revived Howard Theatre will serve as a unique reception space for what is sure to be one of the most talked about events of the year. Conveniently located near 7th and T st. NW in the heart of DC this metro accessible venue will set the stage for a night of impeccable elegance. Attendees can anticipate a mature, 21 and up, sophisticated crowd. With the success of his debut album “Finally Famous”, hip-hop artist Big Sean has a lot to celebrate. Therefore it is fitting that he hosts his exclusive event at DC’s most talked about and historic landmark, alongside DC’s elite + other celebrities. Unprecedented in nature, poised in presentation and exquisite in execution this is set to be the social event of the spring! 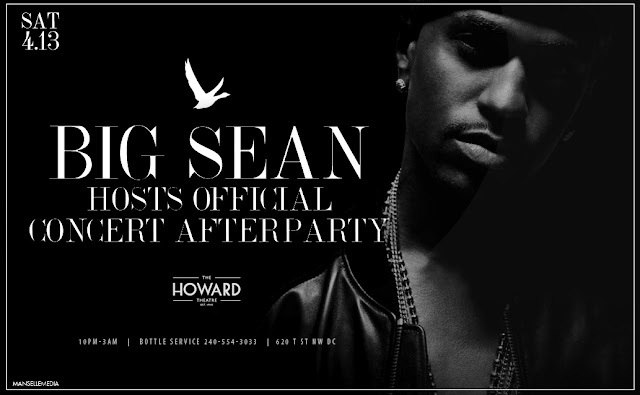 To purchase tickets visit: http://bigseanhowardtheatre.eventbrite.com. This event is 21+. For bottle service or for table reservations, please contact 240.554.3033 or email bottleservice@daveandray.com. Stay tuned to updates about the event by following @DAVEANDRAY and @STANDARD_EVENTS on Twitter.